Despite the weather still playing tricks on us as evidenced by the variance in day to day temperatures, a few telltale signs have indicated that spring is officially here. 1. My deck is yellow; 2. My plants are just starting to sprout little green buds; 3. That evening daylight is letting us squeeze in a little extra each day; and 4. My living room has been taken over with cool colors and fresh decor! 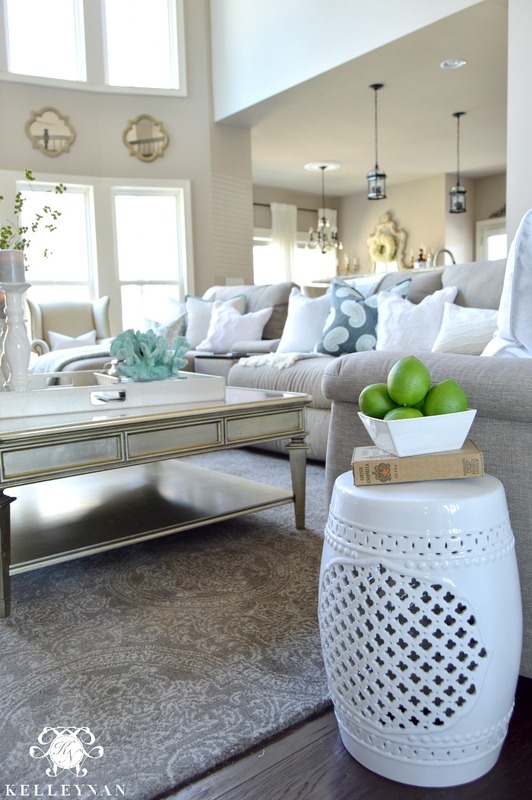 The transition from winter whites to subtle hints of cool, vibrant colors is simple in a room that has intentionally been designed with a neutral base. 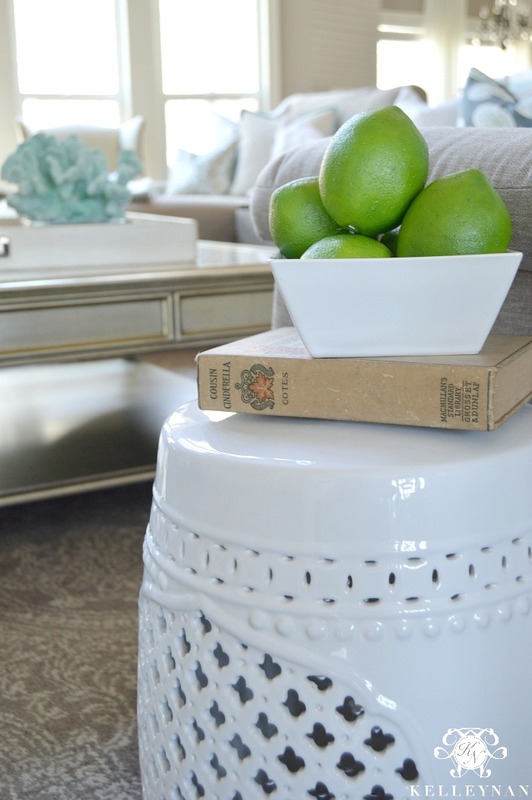 Follow along as I share the methods I used to create my fresh, spring-ready space. In the fall, I primarily used grays and navy (check out my FALL HOME TOUR) and in the winter, I used a lot of white and silver with gold accents (check out my CHRISTMAS HOME TOUR). To start the season, I wanted something softer than the turquoise I used last spring/summer, and more colorful than the icy blue I moved to before fall. I settled on an aqua accent which evolved into an accompanying darker, soft blue with green sprinkled in. While I have only had this color palette present for a short, time, I have already been able to try out a few additional accent colors through floral arrangements. While the cool hues go well with the obvious (white and other cool tones), pink and yellow have also complimented this color scheme well. Most recently, and what you will see throughout this tour, is my favorite additional floral color infusion: purple. Three of my newest obsessions since 2016 started can all be spotted in this one line of sight: fruit, coral, and garden stools! While I talked about it a little in a previous post, faux fruit and veggies have become a decor staple for me and I am now taking them outside the kitchen. And, I love it. While I don’t thrift often (I totally do want to be that person, though), I did pick up a few antique hardbacks during a recent visit with my mom in Fairhope, Alabama. I quickly found spots for each of my spoils and will be picking up more vintage books ASAP. When I put the fireplace tools away for the season, it provided a new little surface to welcome spring. I brought out a couple of square lantern hurricanes, formerly forgotten and buried deep in the basement, and added a few white pillars at staggered heights. Teamed up with my little green thyme plant, I feel like the hearth is ready for a spring garden party. Using lots of green and natural elements is absolutely my top way to say “Hey, world! Spring is here!” These mossy stems are super easy to manipulate; I picked up three for this arrangement. I do have several cute teacups with blooms spread around the house, but for this dainty floral pop, I actually used an espresso cup from THIS SET. Also, no my tray isn’t doubling as an underwater reef, I just can’t get enough of that coral! 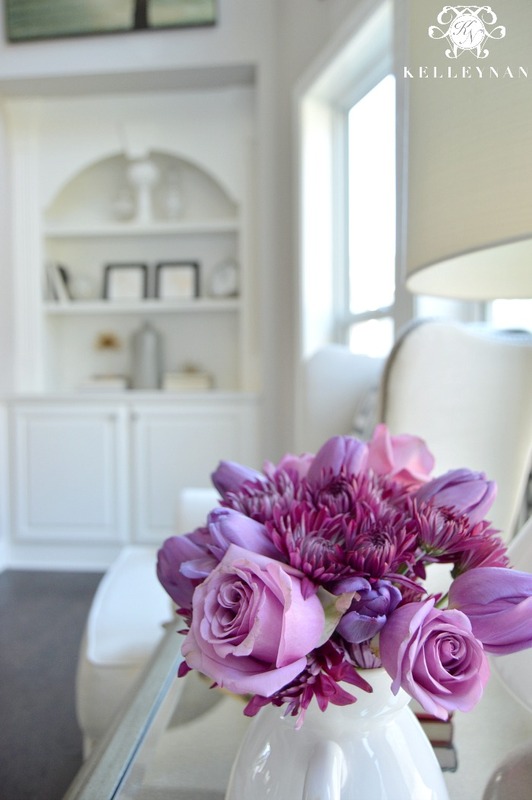 Staying true to my neutral roots, the simple, temporary purple arrangement changes everything. I don’t put away all my thick winter throws (usually just the furs), but I do add a few lightweight blankets to the mix like this little white number. 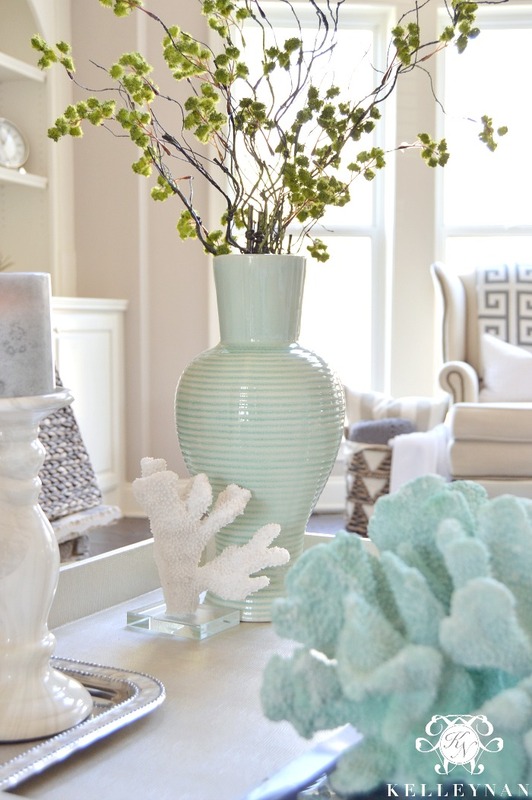 To create that springtime feel, color is a good place to start, but look at the materials you are using, also. As much as I can’t resist a good sequin or bead, I try to keep my warm weather pillows in lighter fabrics (think linen and cotton) with less embellishment. 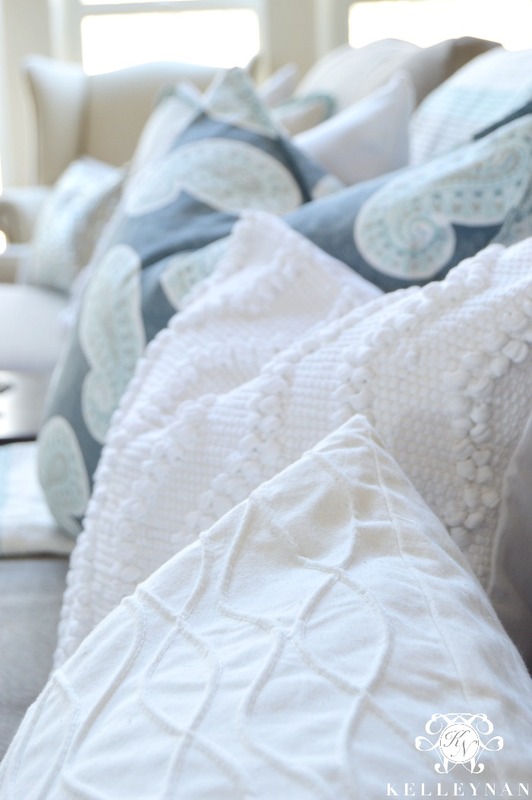 When you have a stock of neutral pillows, you can use them throughout the year and just sub in a few seasonal favs. See? I told you I had teacups sprinkled throughout 😉 Whenever I have a large arrangement that only has a few survivors, instead of consolidating into one vase, I like to take a few smaller vessels and spread the flowers around. 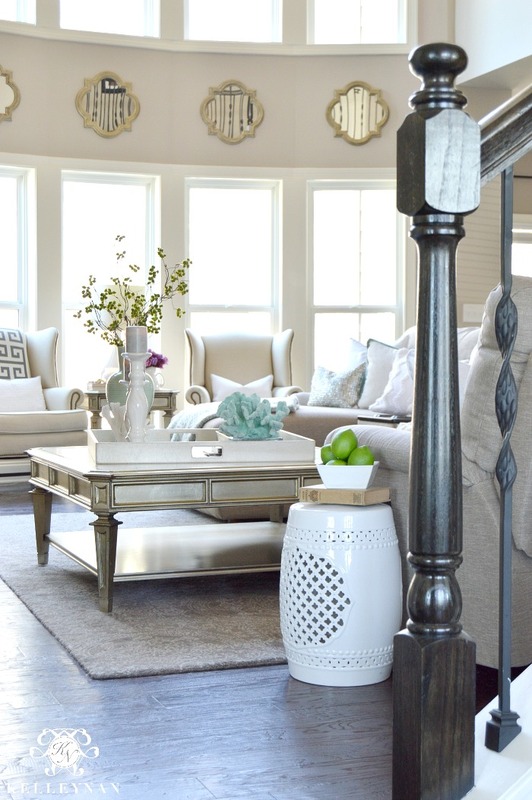 In case you missed it, you can read about my quatrefoil mirrors I used as a third row of windows HERE. My living room is one big mixture of formal/casual. We spend a lot of time here so it has to be comfortable and functional, but it is the central and most visible part of our home so I don’t want it to look like a basement den. 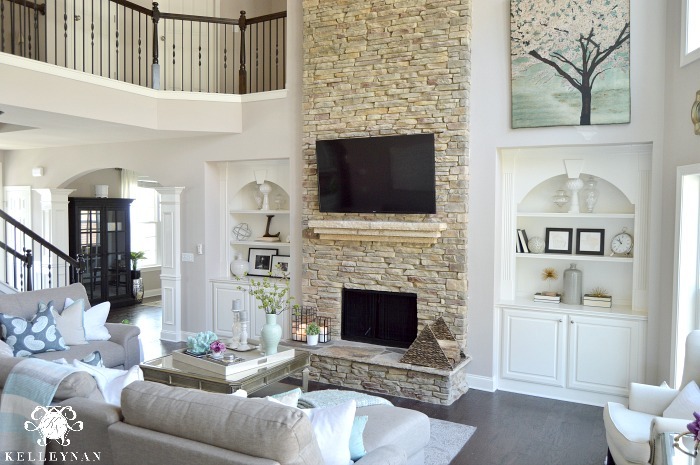 Some of the architectural elements in the room are a huge help, but without some of the more “dressed up” accent choices, the large tv and reclining sofa with cupholders could have quickly spun this space in something more fit for a man cave. One of the most common misconceptions is that you have to stick to one universal style across the room to make it cohesive. While I would be careful about how many styles you are using (yet another reason I love a neutral base), mixing casual with more structured pieces can make your space functional and aesthetically pleasing. We have a mirrored coffee table with champagne finish that we paired with a reclining La-Z-Boy sofa… and it works. We brought in some wing backs to contrast the plushness… and, they work too. Don’t be scared to think outside the box to achieve your goals within your home. 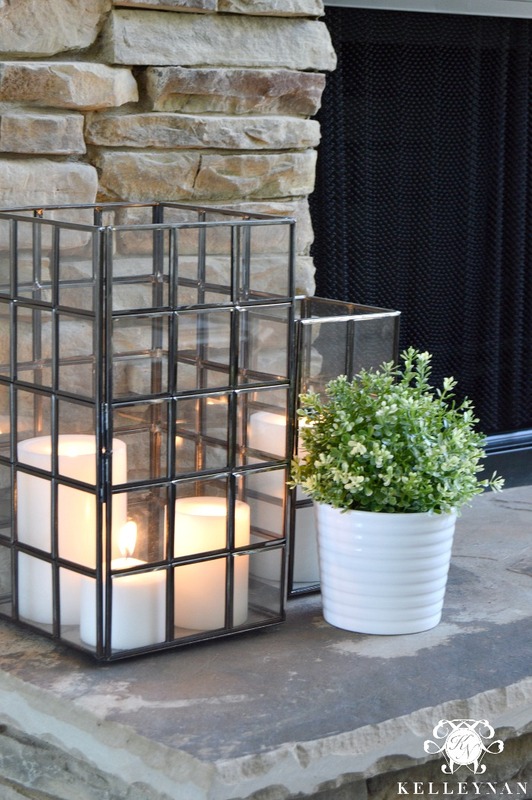 If you are itching (hopefully not from pollen) for some more spring decor and inspiration, be sure to check out the posts shared by the group I have joined below. 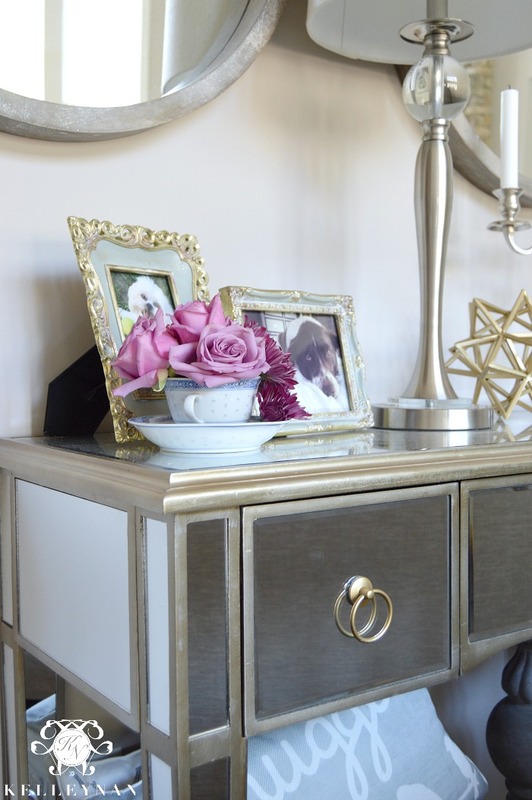 You won’t want to miss any of these ideas! Hello! Love your style. Can you tell me where you got your couch? Love that sectional also!! It looks super comfy and gorgeous! I have a quick question. We are thinking of building a home and was wondering if you have the dimensions of the room that the sectional is in. It seems like the perfect size! Hi, Lin- which piece are you referring? Can you tell me the color that is on this aspen sectional. Is the fabric of the sofa textured? Is it linen? Any help you could offer on the color? Janet, thank you! I am so inspired by your beautiful touches. All those mini arrangements are beautiful. I’m gravitating towards the purple, I’m not gonna lie. That coral is a really close second!!! Bree, thank you so much! Like I said, I think I want to go back and add in yellow with that aqua. Yours is stellar! 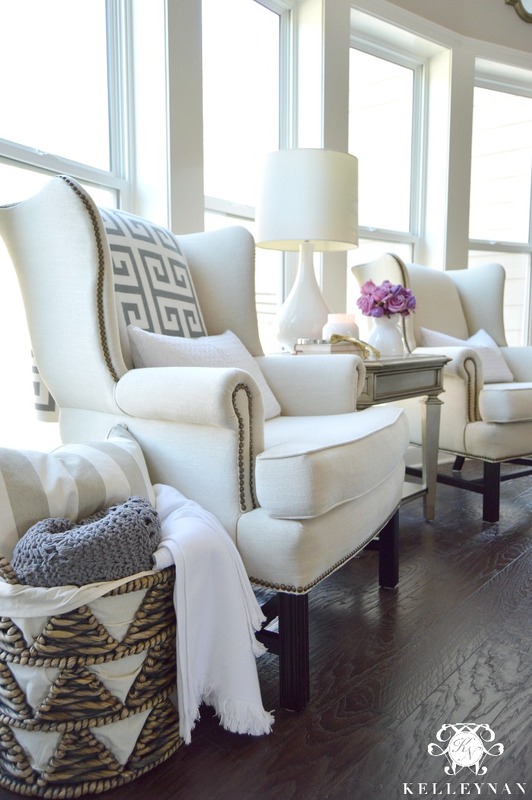 Loving the purple in your great room with your beautiful neutral chairs Kel! Also, love that you frame photos of your dogs! I used to do that too, now I just frame my kids..haha! All that coral makes me want to run to the nearest Homegoods and get some! Shauna! hahaha I have actually “toned down” some of the “kids’ portraits”. *covers eyes with hands* And yes, I have gotten a lot more coral this year; I may just go back and keep going haha! Gorgeous Kel! 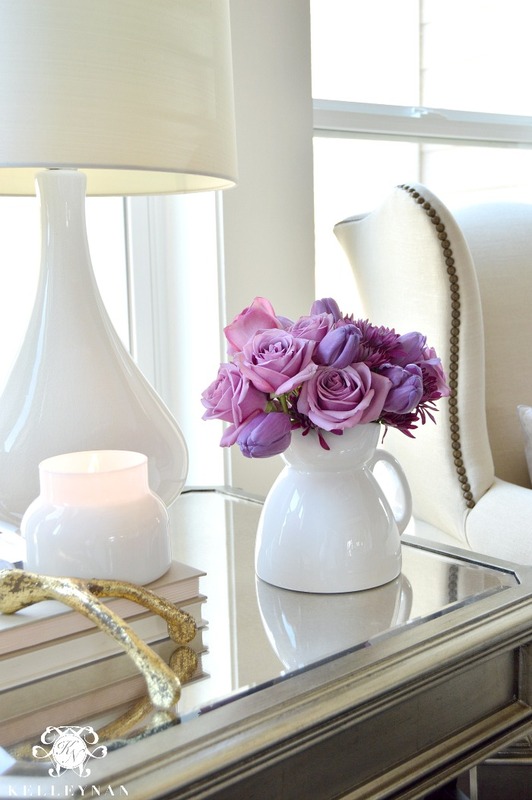 Loving the soft blues & purples that goes so beautifully with your neutrals. I want to come over in the Spring haha xo! Kel!!! This is just gorg! Aqua and that fuchsia is one of my absolute favorite color combos!! (as is the pink/green on a maybelline mascara tube lol! no joke, love it so much!) That aqua coral just went into my shopping cart and loving all the teacups. Thanks for such inspiration! Sitting on my hotel bed and going through all of these blog posts and just swooning! 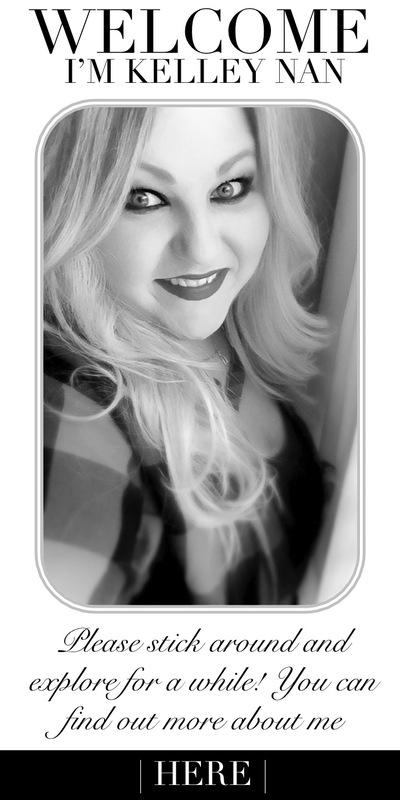 xoxo….. I love your chairs with the nail-head trim…and your home flooring and stack stone fireplace is beautiful. 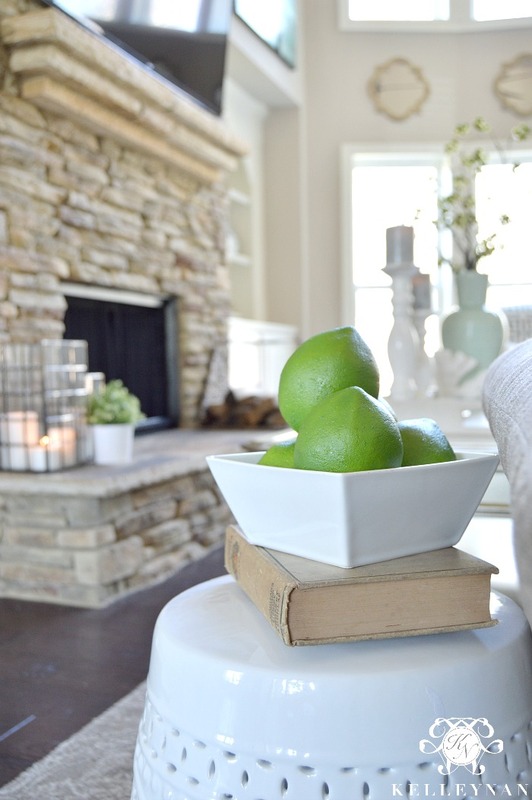 Wonderful fresh colors….i need to get off my tush and paint my walls light gray…i have dingy beige. What keeps me from doing it is 9 years ago it never dawned me that when i picked a darker color the builder would paint the ceilings the same color in the entire house. Years ago i did attempt painting one room and had neck and arm cramps from painting the ceiling so i stopped…i have great respect for painters. Have a great week! Love it! 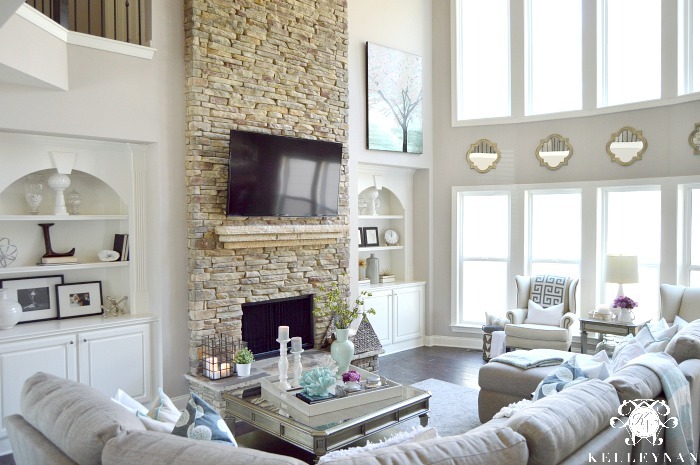 What paint color did you use in your living room?? Karina, thank you! It is Versatile Gray from Sherwin Williams. I love your sofa!! I have been searching all over for a big comfy yet elegant sectional. Do you have the color/style fabric? The fabric can make all the difference in the world with the look. Beautiful! Where did you get your sectional? Can you please tell me more about the rug in this room? Hi, Amy- I found this at HomeGoods- one of those lucky deals! What would you like to know? Lucky you! The brand and any style name or info would be great! I love your living room decor! I was wondering how did you mounted and plug the TV cables? I really like that all cables are hidden, how did you make that happen? 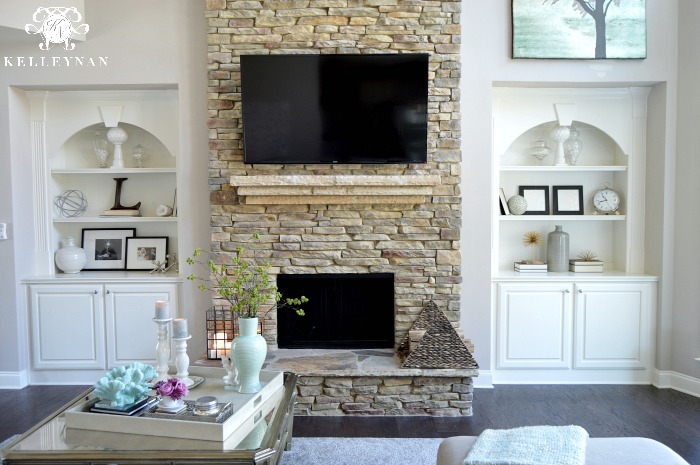 What kind kind of stone is used on the fireplace? Charles, I wish I could tell you. Unfortunately, I picked it out without paying attention. LOVE LOVE LOVE!!! What is your flooring? Hey! Not sure if you mentioned this already but are the flowers real? If not, where do you buy them? I didn’t know Trader Joe’s had flowers as I’ve never been in there! I will go now. lol…. Gorgeous! This room is beautiful! 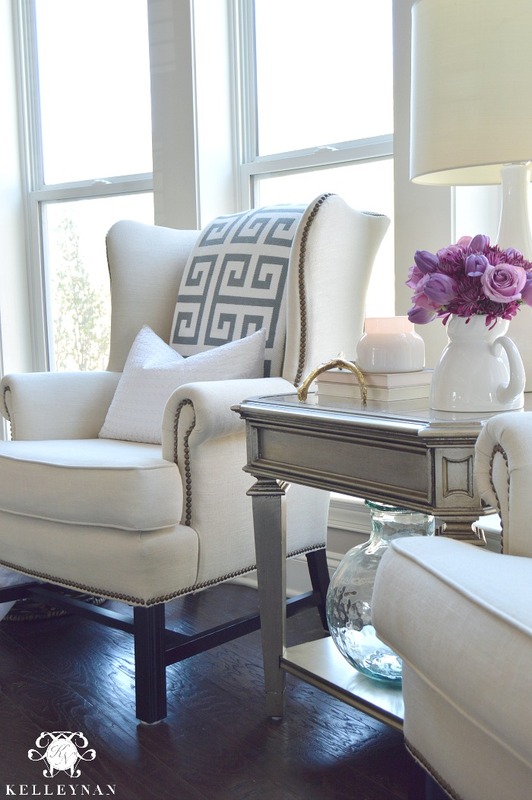 Where are the two wingback chairs from? 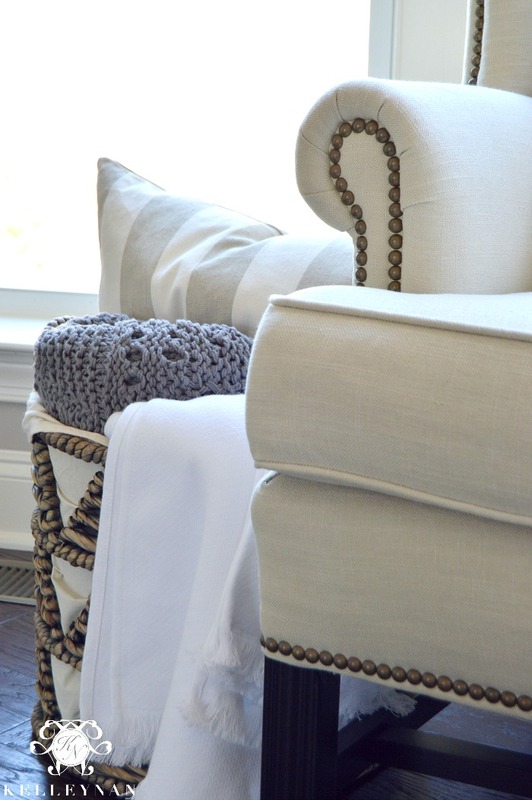 What fabric and color are your wing back chairs? Hi Kelley! I love your style. 🙂 I found you on Instagram. I was wondering – do you take your own photos? What camera do you use? Hi Kelly – we are trying to do a similar mantle. 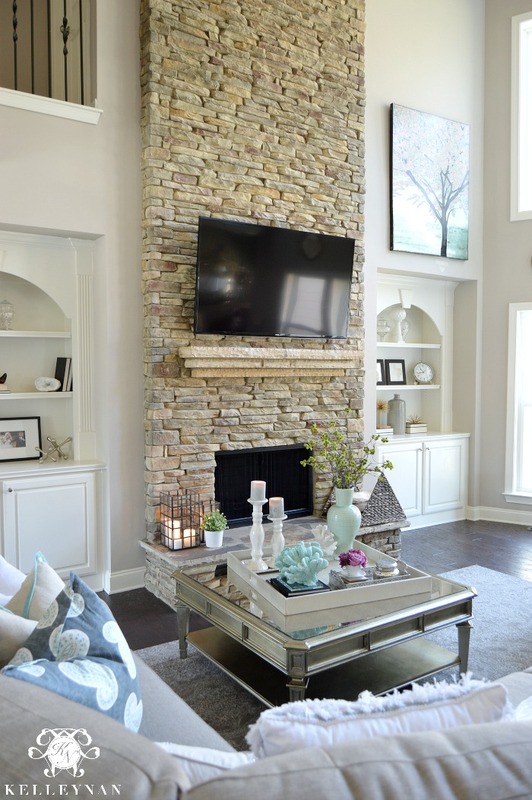 Do you have any specifications on this mantle? It is gorgeous! Thank you so much! I believe it is about 60″ wide; it is also a fabricated stone. In LOVE with your decor!! Where did you get your pillows and coral? Love it! We are designing a similar room right now. What is the length from window wall to stairs? Or window wall to end of built-in? I’m so bad at judging space in pictures but this looks exactly how I want mine! 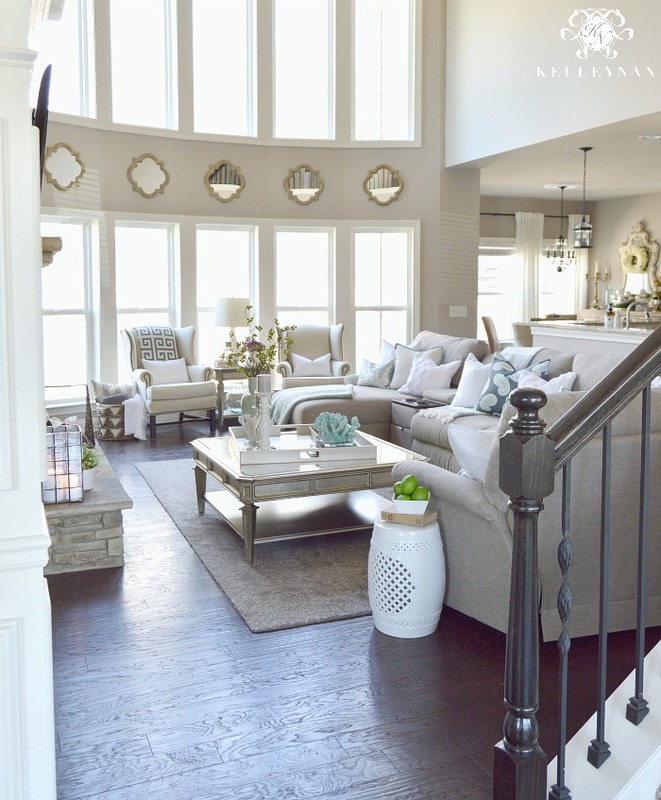 Lots of seating/light and pretty/but totally livable! Hi! It’s beautiful-I love everything! What are the dimensions of that room? Heather, I’m not quite sure; I would have to measure. Hi Kelley. I just found this online. Do you happen to have or know the dimensions for this room? It’s beautiful. Gorgeous home!! 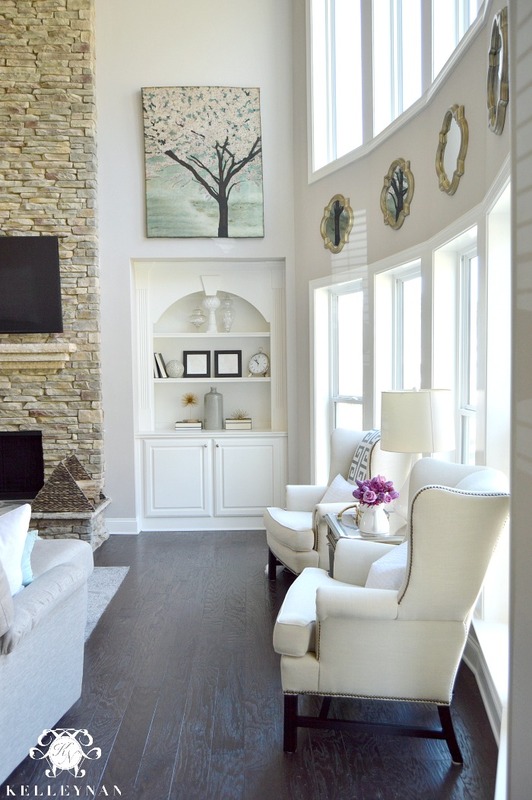 Would love to know the color of the trim and bookshelves?? It looks so clean and white… But not too stark white like a lot of trim colors..
Hi, Laura! It is Creamy by Sherwin Williams. Hi Kelly! I just moved and my great room is almost exactly like yours. I have been searching for a sectional and this would be perfect! Th size and color are what I need! 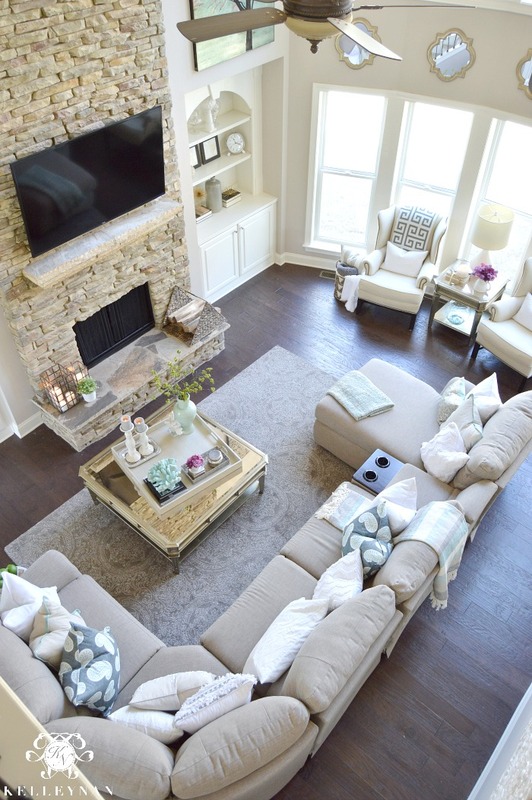 Did you have any luck finding the name or number of the fabric of the sectional? Any help is appreciated! Hi, Angela! Thank you! I actually just called; the fabric was “Cobblestone” and is now discontinued :/ It looks like they still have a lot of similar ones, though! I would definitely look at swatches in person. Best of luck! Thanks so much for getting back to me!! Love your fireplace. I saw in an earlier comment that you didn’t remember the name of the stone you used, but could you tell me if you used a mason to install it because it was individual stone or if it goes on more like a stacked stone tile that came in sheets? Hi, Angela! It was part of our construction but it was done individually. 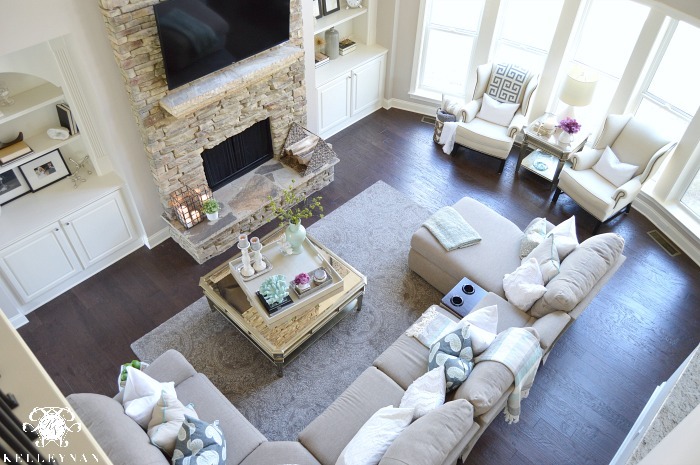 love the look of your living room, the tone color its kinda soothing and the hardwood ! i love the color on that woodenfloor, what kind of wood do u use? 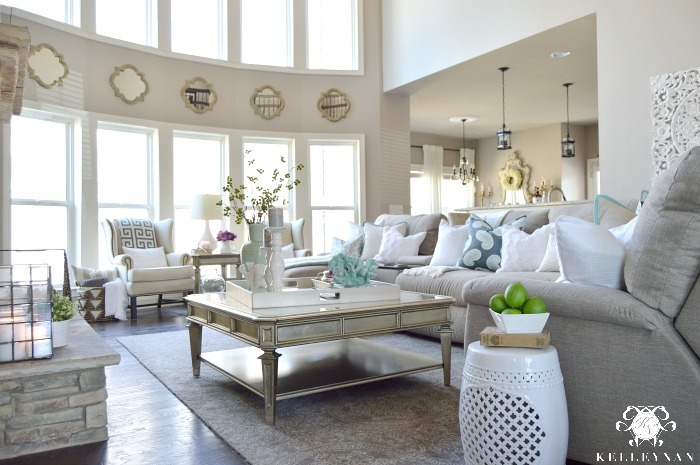 Love all the different looks you do for this room. Interested in seeing what you do for Winter … after all the Christmas decor is put away. Can you share give us another tour specifically for the Winter season? Could you tell me the dimensions of this room? We are adding an addition to our home and this room looks to be the perfect size for what I am wanting. Thanks! Hi, Brittany! I don’t have anything to reference and they aren’t written down; I would have to take measurements when I am able. Hi, First your home is beautiful! I tried clicking on the link for the chairs in your living room (the 2 beautiful ones with the nail head), I think the link is no longer functioning may I know where you got them from please. Thanks. Are you still enjoying your sofa? Have there been any downsides? I’m interested in making the investment in this piece but looking for cushions that will stay firm for more than 1-2 years. Loved your pics and advice in this post!